Breakfast buffet, originally uploaded by Camemberu. First heard about the Beach Hut's sunday breakfast buffet in an old Makansutra thread. Back then (in 2004) it was S$6.90 for what sounded like a really good spread. I was curious to see if this deal was still going on, so today we schlepped baby along for a morning walk along East Coast Parkway to check out the joint. 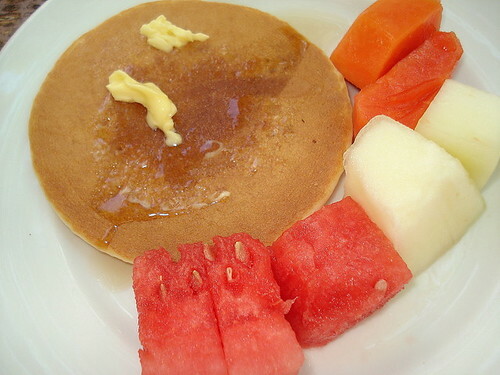 Pancakes with fruits, originally uploaded by Camemberu. 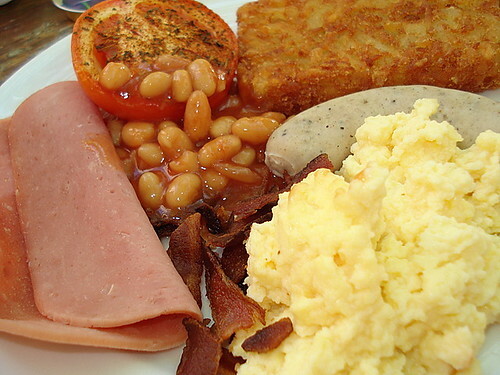 Ah yes, the brunch is still on indeed but it is now $9.90+++ (about S$11.55 all in). There were about eight self-service trays of scrambled eggs, ham, bacon, baked beans, hash browns, grilled tomatoes, sausages and pancakes. A separate station served eggs done in the style of your choice - sunny side up, over easy, etc. Toast with butter and jam. Surprisingly, chicken porridge too (with condiments). Some cut fruits (watermelon, papaya, honeydew and banana) on the side. Juice, iced water, coffee and tea complete the picture. 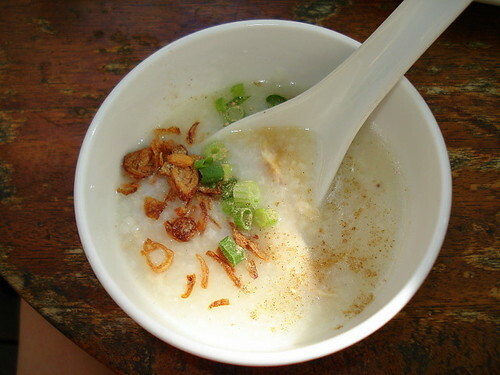 Chicken Porridge, originally uploaded by Camemberu. Sounds like a good spread? Well, yeah. But unfortunately not tasty. The stuff in the trays were dried out (especially ham, tomato and pancakes). Some items like bacon were gone in a flash and took forever to be replenished. Sausages were plain-tasting and porridge probably had too much MSG. Only thing I enjoyed was the crispy hash brown. The other downside...you will very likely be taking this meal while sweating buckets amidst the scorching heat that always seems to pervade the East Coast beach scene. Seems very popular with whiteys though. Don't they just love this insanely hot weather? As for me, I don't think I'll be back to eat this way.